For quite a while I’ve felt I’m way outside of the audience for photographic educational material. In particular stuff like “How To Make Perfect Landscape Photos”, etc. Not that I’m saying I don’t need them, just that I’m impenetrable to such words of wisdom. I’ve read, and watched, everything I could find on the topic, and very little has sunk in. So my reaction to seeing such things on offer tends to be rather cynical. 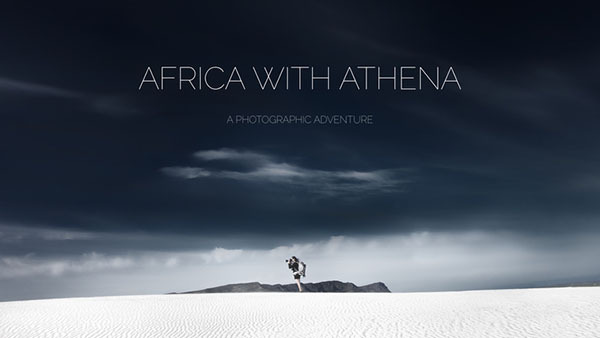 So why my interest was sparked by a web site I stumbled upon during the post-Christmas doldrums, offering an “exclusive, travelogue-style video tutorial” featuring landscape photographer Athena Carey on location in South Africa, I’m really not sure. But since clicking on the preview was a lot less like hard work than, say, editing several extensive photo collections I’ve built up and ignored in the last year or so, I did so. And I was intrigued, And since it was on special offer, I clicked. I’ve seen my fair share of “video photo tutorials”. They generally promise a lot, and end up being endless, tedious talking head shots of men, usually of a certain age, fondling their cameras. Some are more professional than others, in that they’ll do some level of editing. Others just set the camera to record, stop after 2 hours and 55 minutes, and sell you the resulting yawn-a-thon for $75. And of course after watching this you’ll have fully assimilated their precious workflow and wisdom. So I’m a hard sell. “Africa with Athena” is nothing like these, and on several key counts. First of all, it is obvious from the first seconds that the video has been produced by somebody who actually cares about communication, inspiration and entertainment, and also cares about producing the best possible experience. It is clear that very little cost or effort has been spared in the making of this video. It has nothing to envy anything you’ll find under the National Geographic or BBC banners. I’m sure that Armand Dijcks, the producer and videographer, makes mistakes just like the rest of us, but we’re not treated to them in the final product. Instead we’re treated to a technically and artistic excellent video, with a perfect mix of sweeping, dramatic but also intimate location shots, and indeed talking heads. But these talking heads - well, always the same head - are expressive and varied and shot with different angles and situations which emphasise and help to carry the message. I’m a million miles away from being any expert on the topic, but as a pure consumer, I find it a very impressive production, which is well worth the asking price. I haven’t even really mentioned the content yet. Well, the content is basically Athena Carey. Hers is not a name I’d come across before, but she seems to have a good reputation. Certainly her photography has a strong personality, mainly orientated towards long exposure monochrome. This might immediately, and inevitably, bring Michael Kenna to mind, but her work is quite different. Of photographers I know, she’s perhaps closer to Steve Gosling, but in any case she has a distinctive style. Her approach in the field, and to photography in general, which is well documented here, remind me more of the approach of my friend Alessandra Meniconzi. Both are interested in equipment up to the point that it allows them to do what they want, and absolutely no more. Indeed, the section on the contents of Athena’s camera bag veers towards humour. Essentially, and clearly getting things out of the way as quick as possible, she tells us she’s got a big camera and a smaller one converted to infrared, oh, and some filters, and that’s basically it. I don’t think brand names are even mentioned. A similar segment over at the Luminous Landscape would be 45 minutes long and sound like a 10 year old child reading the B&H catalogue. This is pretty refreshing to me, but I’m not entirely sure if, unfortunately, it’s what the mainstream audience for this type of offer wants to hear. But there is technical content. In fact her description of how she uses Nik SiverEFX to convert to monochrome is the best I’ve ever seen, and although I’ve been using this software for years, watching this I discovered a few key points I’d never realised before. 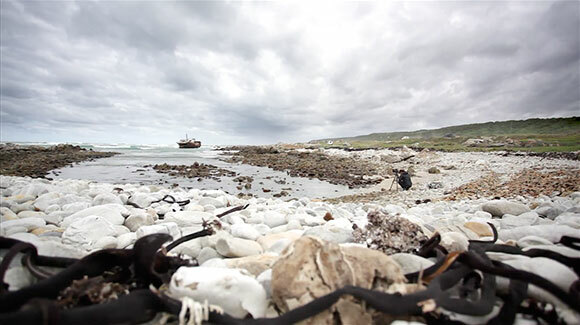 Most of all the video is about a dedicated and committed photographer collaborating with a talented videographer to illustrate her process to produce a couple of photos in a particular location. It does this without being arcane, patronising, or boring. I think it is generally very hard, if not impossible, to truly express in words what makes us photograph, especially for landscape photography. All attempts come across as pompous, clumsy or ridiculous. Generally of course they’re produced by the photographers themselves, which prevents the necessary detachment. Here instead the creative partnership works very well, delivering the goods both as medium and message. It sets a very high standard for others to follow. Ming Thein runs one of the most outstanding photography blogs on the web today. His combination of posting frequency, quality of content, quantity and depth of content, lucid writing, and tasteful presentation free of third party advertising is probably unique. On top of this, he engages fully with his readers in the comments sections, and last, but very much not least, is a talented photographer with a killer instinct for composition, and a commitment bordering on obsession with precision and technical quality. Why, I wonder, does he pour so much energy into this? I assume that the underlying driver is to build his brand, both as a professional photographer, but also as an educator, a purveyor of workshops and training materials. Since I am a compulsive, if intermittent, consumer of such materials, I decided to take up a special offer a few months ago to buy his “Photoshop Workflow 2” video. Since I haven’t seen any independent reviews of his videos, I decided to throw my hat into the ring. When Ming publishes a review, he tells things as he sees them, fairly, but without pulling punches, and from his clearly stated subjective point of view. Witness his review of the new wonder box Sony A7RII, which I found pretty refreshing. 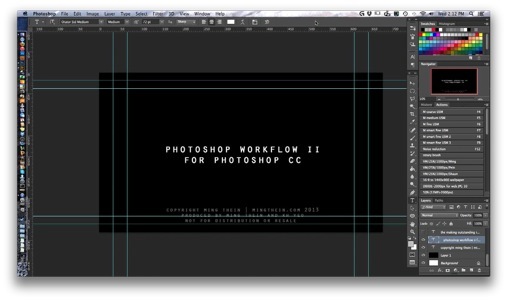 So I’m going to take the same approach to “Photoshop Workflow 2”. The basic questions I’m looking to answer are “were the videos useful to me”, “would I recommend them to a beginner”, and “would I recommend them in general”. The answers are, “not really”, “no”, and “it depends”. The video is split into 2 parts, and covers Ming’s full end to end workflow, from import through to print-ready output. The subject matter here is not a tutorial on Adobe Camera Raw and Photoshop, as such, but rather a description of the specific process Ming uses to streamline his image processing and to produce output in his adopted style. So if you’re interested in finding out, in detail, how he uses these tools, then you might be interested in these videos. If you’re looking for a more wide-ranging, open-ended discussion, then probably not. The workflow uses Adobe Bridge, Adobe Camera Raw and Photoshop, nothing else. The video starts off with a lengthy preamble about choosing and setting up equipment. There’s not much to quibble about here, even if I would have expected a professional photographer to adopt a more suitable display than Apple’s shiny Thunderbolt Display, but one section had me spluttering in my coffee. Ming recommends carrying out the critical step of monitor calibration by eye, using Apple’s software calibration utility. At best this can only lead to a good subjective calibration. Maybe Ming has superhuman eyesight and colour discrimination to go with his astronomical IQ, but generally it will lead to a medium to poor subjective calibration. In a closed, end to end flow where your output is going nowhere else than a single printer, this might work. But otherwise it’s a recipe for disaster and lot of wasted paper. Decent hardware calibrators are neither expensive nor hard to use. It amazes me that Ming disdains to use one, especially given his geeky side. To add insult to injury, the sequence showing the software calibration in use is a waste of time, as for some reason the screen capture does not show any activity in calibration tool screens: the viewer cannot see what the narrator is describing. The workflow itself is split in a set of steps: ingest the images, rate them iteratively in Bridge, bring the picks into Camera Raw, sort out the white balance and any colour issues, and adjust the exposure as high as possible without clipping. Then export to Photoshop. 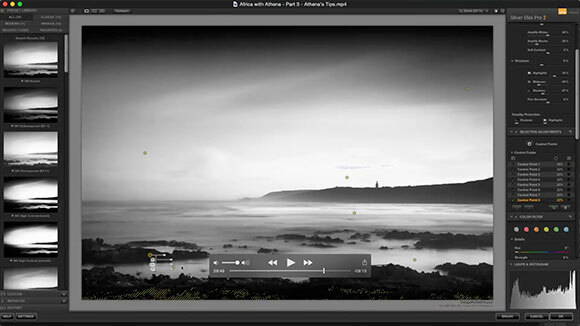 In Photoshop, switch to LAB mode and adjust the exposure globally to taste using one or more tone curves. Then adjust exposure locally using the dodge and burn tools. And sharpen appropriately. That’s basically it. What I find surprising is first, on the input, total disinterest in keywording or any kind of asset management. I guess when you’ve got a brain the size of a planet you don’t need any help remembering where your photos are. Or where they’re from. The second thing is pretty much completely eschewing layers in Photoshop, largely sacrificed on the altar of LAB mode editing. Well, it’s his workflow, but I have to say he’s out on a limb on that point! I’m not going to comment further on the content. It is exactly as promised, no more, no less. The rest of this review is about the video itself. As mentioned before, it is split into 2 parts, running over 130 and 100 minutes respectively. I’ll say this immediately, that is far, far too long. For the first 8 minutes all we see is a static Photoshop screen with the title, and Ming talking over it. Obviously, a tutorial needs an introduction, but really it also needs a few hooks up front to get the viewer interested. A short talking head sequence might have been a nice touch. Ming’s delivery tends to be rather flat and hesitant, and although not too bad, really cannot comfortably carry a 4.5 hour monologue! “Ums”, repetitions, sudden switch of context, and various mannerisms quickly get annoying, and should be edited. Also, his Mac keeps interrupting him demanding to do software updates. Annoying, yes, but for such a production, he really should have stopped, disabled updates, and started again. This, and other things, gives the impression of a one-take capture, with no post editing whatsoever. Presumably he did take a comfort break every now and then. Anyway, this then leads into what was the most interesting part for me, Curation. This is the process of reviewing a collection of images and deciding which ones to take forward. Actually, id argue that Curation also requires a clear objective, like a book, an exhibition, or a portfolio. Here, I’d argue that he’s culling, a pre-requisite to curation. His methodology and especially thoughts about the image are interesting, but, again, it’s way too drawn out. He does not need 136 photos to make the point. They finally get wittled down to 19 at 45 minutes in. This is fast, but not when you’re presenting it on video. It’s a bit like cookery shows - sure, the roast took 2 hours to cook, but we didn’t get a 2 hour shot of an oven door. 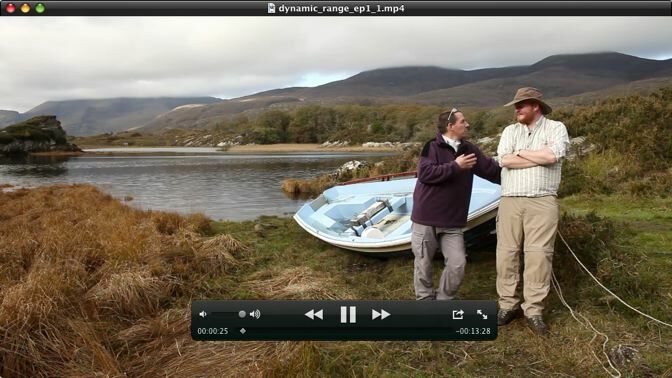 Next up comes the colour management sequence mentioned earlier. Skip this. Finally, at 1:24, the section on workflow starts. It is interesting, but again, it drags a bit. The referring back to an earlier version of the video is also irritating - unless it comes as part of the package, it should not be assumed that the viewer is familiar with it. Also, key concepts, such as dodging and burning, seem to get rather light treatment. Nevertheless, Ming’s method of dealing with exposure is very educative. What is, in my view, extremely poor, is that in his first, lengthy Photoshop workflow, when extolling the virtues of LAB mode, it turns out he was in RGB mode all the time. Anybody can make a mistake, but apart from any discussion of the fact that even he could not tell the difference, surely the professional thing to do would be to go back and reshoot the sequence. There then follows a sequence talking through the processing of different images, which is quite engaging. Finally, there is a useful, short, discussion of Camera Raw as a filter on a TIFF image, which is an area of Photoshop I had never explored. Wrapping up is a section on Fuji X-Trans files. Doubtless this is interesting to Fuji owners, but for me, and I assume other non-Fuji owners, it’s 20 minutes of padding. And here we get to the point I’ve avoided so far: why so long, and why the padding? Well, I suspect that in part it is to justify the rather extravagant pricing: Photoshop Workflow 2 costs $80, standalone (various discounted bundles are offered), including access to source files to work on. Arguably $80 is reasonable, given the content. But for this price, I’d expect better narrative, some evidence of post-editing, tidying up or re-shooting messy segments, and more weight on detail rather than repetition. In fact, the final 4 minute wrap up pretty much gives you an adequate overview! The X-trans section should be a separate, possibly free, download. Another product in the same ballpark, Michael Reichmann and Jeff Schewe’s epic “Camera to Print & Screen”, which offers 59 easily digestible segments totalling over 12 hours, with a vast scope, costs $60, and is frankly a lot more entertaining. I would like to emphasise that this is a review of a product, not of it’s author. Ming Thein is a fine photographer, and a great, positive contributor to the photography internet. He holds himself to very high standards in his writing and his photography, but at least in this case, for video he doesn’t quite reach the mark. This view, of course, is coloured by the high relative pricing of his videos. Ignoring that small point, then there is little to criticise. So, coming back to my questions: “was the video useful to me”: not really, but I did find his method of working with exposure interesting, albeit because I’ve been roughly doing something similar myself. But to be honest I would say I was reminded of a few key points, but I didn’t discover much new; “would I recommend it to a beginner”: no - it’s way too expensive and way too long to hold attention - and “would I recommend them in general”: well, if you want to make photos that look like Ming Thein’s yes. Otherwise, probably not. I don’t regret paying for this video, and others I got as part of a bundle, because in any case I consider it in part supporting Ming in maintaining his excellent web site. But I do think he should take a step back, and see if he could improve his production standards to find a better way to deliver his valuable knowledge and artistry.